For other ships with the same name, see USS Parche. USS Parche (SSN-683) off Pearl Harbor, Hawaii, sometime prior to October 1985. The structure on the after part of her casing is a permanently attached swimmer lock-out chamber, although described under its cover story as Deep Submergence Rescue Vehicle. Her ship's insignia is at lower right. USS Parche (SSN-683), a Sturgeon-class submarine, was the second ship of the United States Navy to be named for the parche /ˌpɑːrˈtʃeɪ/, a small, coral reef butterfly fish. Parche was launched on 13 January 1973, sponsored by Mrs. Philip A. Beshany, and commissioned on 17 August 1974 with Commander Richard N. Charles in command. Attributed as being a key resource of the National Underwater Reconnaissance Office, Parche is said to be "the most highly decorated vessel in U.S. history." Parche served as a unit of the United States Atlantic Fleet Submarine Force from 1974 until 1976, before transferring to the United States Pacific Fleet in October 1976. Once arriving at her new home port at Mare Island Naval Shipyard in Vallejo, California, Parche received ocean engineering modifications. Parche deployed on a shakedown training cruise in August and September 1978. In the book Blind Man's Bluff, it is claimed that Parche successfully tapped into Soviet underwater military communication cables in the Sea of Okhotsk as part of Operation Ivy Bells. During her career, Parche was involved in recovering Soviet missile fragments from the seabed following test launches. Much of her operational history was spent undertaking missions of a clandestine nature, and as of late 2009, a vast majority of the missions undertaken remain classified. From 1987 to 1991, Parche underwent an extended refueling overhaul at Mare Island Naval Shipyard during which she was modified for research and development work. An extension measuring 100 feet (30 m) was added to her hull just forward of her sail. The added section was flat-topped (looking somewhat like the missile deck of a ballistic missile submarine) and provided the space required to support a larger crew and additional equipment. These additions included an extensive array of signals-intelligence-collecting antennas, electronic gear, and other navigational and ocean engineering equipment. The overhaul also added many auxiliary navigational and maneuvering features, including both upward and forward-facing short-range sonars, and a suite of armored spotlights and closed-circuit television cameras for under-ice operations. 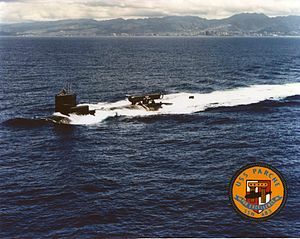 Upon completion of her modifications in 1991, Parche began a new mission as part of Submarine Development Squadron 5. She resumed operations in the Pacific Fleet in 1992. Parche was transferred to a new home port, Naval Base Kitsap at Bangor, Washington, in November 1994. Parche may have recovered Chinese missile fragments. During the Third Taiwan Strait Crisis in 1995 and 1996, the People's Republic of China launched DF-21 and DF-15 ballistic missiles into the sea surrounding Taiwan to deter Taiwan from moving toward independence; Robert Karniol writes: "I suspect that "the Parche might have gone after these Chinese missile fragments", and "I suspect that Beijing gave away some useful missile secrets." Parche returns to port for the last time at Naval Base Kitsap at Bangor, Washington, on 20 September 2004. On 19 October 2004, a decommissioning ceremony took place at Puget Sound Naval Shipyard at Bremerton, Washington; she was officially decommissioned on 18 July 2005 and stricken from the Naval Vessel Register the same day. The wardroom of the oldest submarine in the fleet carries Richard O'Kane's personal cribbage board, and upon the Parche's decommissioning the board was transferred to the next oldest boat: USS Los Angeles (SSN-688). Her scrapping at Puget Sound Naval Shipyard via the Ship and Submarine Recycling Program was completed on 30 November 2006. Parche's research and development duties will be assumed by Jimmy Carter, a Seawolf-class submarine whose construction period was extended to include modifications that will allow her to carry out the same types of research and development. According to Robert Karniol, Jimmy Carter in succeeding Parche, has become "Washington's premier spy submarine." As of 2007, Parche was said to be "the most highly decorated vessel in U.S. history", receiving a total of nine Presidential Unit Citations and ten Navy Unit Commendations. The submarine also received thirteen Navy Expeditionary Medals during her thirty years of service. Parche's sail in the downtown waterfront park at Bremerton, Washington. Parche's sail was preserved. During the summer of 2006 it was moved from Puget Sound Naval Shipyard to a maritime park in downtown Bremerton. ^ a b Tinoko, PO2 Maebel (29 August 2007). "USS Parche Dedicates Sail to Puget Sound Navy Museum NNS070828-19". Navy News Service. Retrieved 5 June 2014. ^ a b c Sontag, S.; Drew, C.; Drew, A. L. (1998). Blind Man's Bluff: The Untold Story of American Submarine Espionage. Harper. ISBN 0-06-103004-X. ^ "USS Los Angeles Embarks With a Piece of Submarine History". US Navy. 16 May 2007. Wikimedia Commons has media related to USS Parche (SSN-683). This page was last edited on 11 November 2018, at 18:59 (UTC).